1. Preheat the oven to 200ºC, gas mark 6. 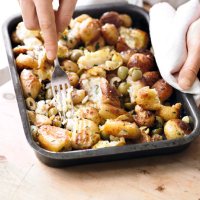 Heat the butter and half the oil in a large roasting tin and add the new potatoes when hot. Cook in the middle of the oven for 30 minutes until golden. Remove and crush roughly with a fork.